After spending years railing against the excesses of the wealthiest Americans, and after refusing to release his full tax returns when he ran for the Democratic nomination against Hillary Clinton, on Monday evening socialist Vermont senator Bernie Sanders released a decade's worth of tax returns which confirm that, as had been extensively leaked before, he is indeed among those that can be called filthy, capitalist millionaires. It turns out that besides being quite wealthy - at least for a socialist - there is little in his returns that is disturbing. Last week, when Bernie first admitted to the NYT that he was a millionaire, he justified his presence in the loathed "1%" club by saying "I wrote a best-selling book... If you write a best-selling book, you can be a millionaire, too." 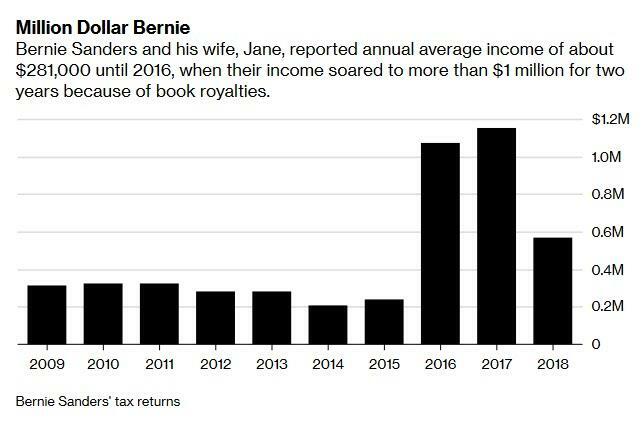 What is odd is just how informative his book - supposedly on socialism or some such - was: as Bloomberg points out, Sanders’s book royalties were larger than many of his 2020 rivals. Elizabeth Warren reported nearly $325,000 in income from her book. Kirsten Gillibrand reported about $50,000 of book deal profits. Since 2016, Sanders has published three books, including “Our Revolution: A Future to Believe In,” which he used to launch his last presidential bid. Curiously, just like in 2016 before his campaign was sabotaged by the Democratic Party, which we learned thanks to Wikileaks and which led to the resignation of Debbie Wasserman-Schulz, Bernie is now once again in the lead among Democratic candidates, although with the publication of his taxes he may find it a challenge to manage the disconnect between his decades of rhetoric about the political power wielded by the wealthy... and his own position within that group. When he ran against Clinton, Sanders released a lone return, from the 2014 tax year, when he earned just over $205K. Since then, as Bloomberg notes, "Sanders has gone from a small-state senator with ideas mostly seen outside the mainstream, to one of the most recognizable politicians in the U.S."
Sanders has joined numerous other 2020 Democratic hopefuls (and there is indeed a great number of them) who have released at least 10 years worth of tax returns, including Senate colleagues Warren, Amy Klobuchar and Kirsten Gillibrand. For some bizarre virtue signaling reason - perhaps to demonstrate to their potential voters just how little they make - the release of tax documents has taken on added importance for Democratic candidates who are eager to contrast themselves with President Trump, who continues to refused to release his tax returns. Asked about the whereabouts of his tax returns in an interview with CBS News last week, Sanders said he would release them by April 15. He joked his supporters might be thrown off by "my trillions of dollars of investment in Saudi Arabia or Russia." Well, no, but they may be thrown off - between Sanders' own generous income, his three residential properties, and his wife's somewhat dismal professional experience which left a local college bankrupt - by what some consider hypocrisy .